To change the method or frequency for notifications, click your name at the top right corner of any page and select Settings. 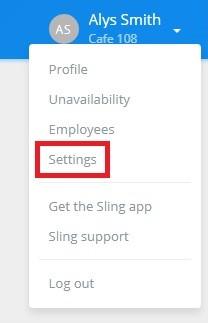 You can also click the Settings tab from the Dashboard. Select the Notifications tab. 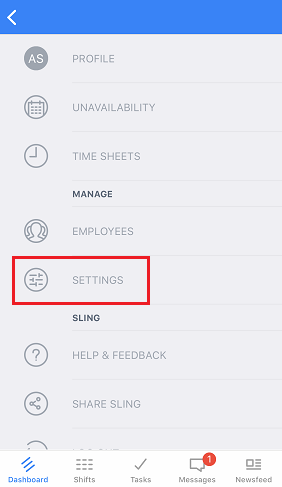 Here, you can select the options you would like for receiving Shift Alarms and notifications for the Dashboard, Messages, Newsfeed, and the Time Clock (if your org uses the feature). Admins and managers will also see options for Daily Report emails and Timesheet notifications on this page. To be sure you get alerts for new schedules and available shifts, it is a good idea to enable some form of Dashboard notifications. Go to the Dashboard and click the menu icon at the top left of your screen. This will bring up a list of options for your notifications. You can switch the toggles to turn an option and/or delivery method on or off. 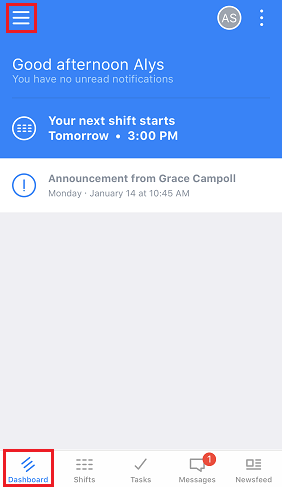 Just like mentioned above, it's a good idea to allow some form of Dashboard notifications so you will be alerted of new schedules and available shifts (among other important info). Need help with Shift Alarms? Find more instructions for those here.